TOKYO - Nikon Corporation is pleased to announce its launch of Download Center on December 17, 2014. Download Center is a global download site that offers software and manuals for Nikon digital cameras and related products. 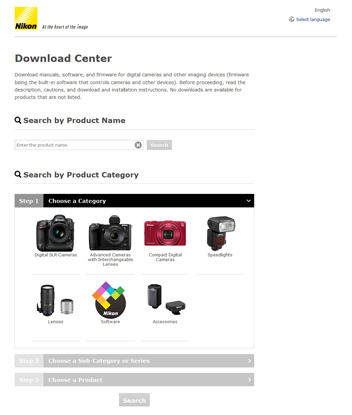 Download Center consolidates and offers downloads of Nikon software and product documentation previously available from the websites administered by our regional subsidiaries around the world. The site supports 43*1 languages, and will provide information on the latest downloads. In addition, the site has been designed with consideration of the viewing and download of information to mobile devices such as smartphones*2. This means that visitors to the site will be able to choose their language and access important download information from these devices. *1Some contents will not be available in all supported languages. *2Only product documentation, such as user's manuals, can be downloaded to mobile devices such as smartphones. With the launch of Download Center, Nikon hopes to provide users of its products with even better service and increase customer satisfaction by consolidating and providing users with a download service supporting various languages.